The Bondholders marketing organisation today (September 4) announced the appointment of a new Chair with a pledge to step up its work promoting the Humber to attract investment and talent. 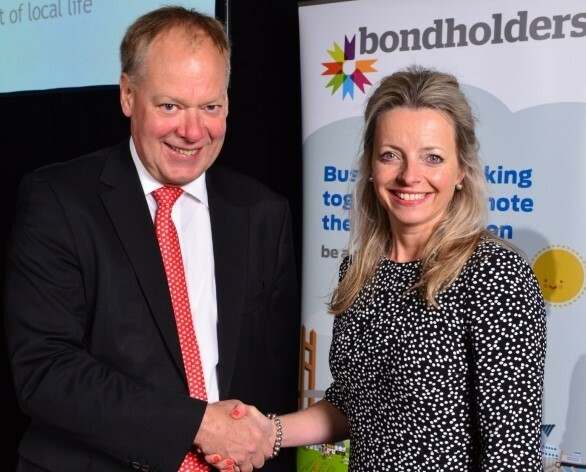 Peter Aarosin handed over the reins to Bondholders Advisory Board member Anita Pace, who brings 20 years of senior marketing and communications experience to the role, at a Bondholders breakfast on the opening day of Hull’s Freedom Festival. Mr Aarosin also announced North Lincolnshire Council had become the latest member, meaning all four local authorities have now come together under the Bondholders banner to promote the Humber. Under Mr Aarosin’s leadership the Bondholders has expanded rapidly to become a truly Humber-wide business network. Membership has increased by 116 companies and organisations over the past two and a half years, bringing the total number of Bondholders to 288. Of these, 110 are based on the south bank or operate Humber-wide. Excellent progress has also been made in promoting the Humber as the UK’s Energy Estuary, a brand developed by the Bondholders which has been embraced by key influencers and decision-makers, including Government ministers. Mr Aarosin said: ‘It has been an absolute pleasure and a very great privilege to lead the Bondholders. Working with our terrific team and all our members, I have been proud to promote the Humber’s strengths and its tremendous potential for growth. ‘Our work to position the Humber as the UK’s Energy Estuary is paying dividends. For the first time we have been able to convey powerfully and convincingly the essence of our region’s economic proposition and elevate the Humber to a position of national and international importance. ‘As an organisation we have very strong foundations. We are totally independent and financially sustainable, which enables our strategy to look ahead to the next five, 10 and 15 years because transforming the image and reputation of any place is a long-term game. Mr Aarosin said work to identify his successor had begun some time ago with several excellent candidates considered and approached before Ms Pace was selected for the role. He said Ms Pace’s exceptional track record in senior marketing and communications roles made her ideal to lead the Bondholders in a period of unprecedented opportunity for the Humber. Ms Pace is currently Director of Media and Contact Centres for local communications provider KC and has held a series of marketing and communications leadership positions with KC and its parent company KCom. She will leave KC shortly to set up her own communications business based in Hull. Ms Pace said: ‘I was flattered to be approached about the role of Bondholders Chair and was immediately interested in playing a greater role in putting the Humber on the global map. Ms Pace said there had never been a better time to promote the Humber as a great place to live, work and invest. She told Bondholders members at the breakfast event: ‘I want to play a part in changing people’s perceptions of the area. I want to help build a positive image. I want to help make a difference. ‘We talk a lot about the perfect storm of opportunity for the region and we all know there is real sense of optimism at the moment. I’m extremely keen for Bondholders not only to continue on our successful journey, supporting and uniting Humber businesses, but also to play a proactive role in helping to exploit every opportunity the region now has. ‘At a time when all eyes are on our region, it is imperative that organisations work collaboratively and focus on aligning the Humber’s message. It is our job to develop and channel the message to support our region’s goals. Ms Pace’s appointment follows the recent recruitment of Sarah Downing as the Bondholders’ new Head of Marketing. Originally from Grimsby, she returned to the area to join the Bondholders from Gardman Ltd, a £70m pa turnover garden products supplier, where she was Marketing Director and a member of the Operational Board.